It seems obvious that science depends on communication although we tend to limit the scope of this word to communication of (raw) results and knowledge. Moreover, we rarely pay any attention to the way the message is transmitted, what is the perception of the message in the public, and finally, what is the strength of the message. We are rational and we don’t need this “marketing” trick, right? Well, it doesn’t seem to be true. Perception of the messages can vary dramatically, depending on many different variables, including such simple thing like who is its author (that’s why there’s strong resistance against anonymizing papers going to review). And we should start paying attention to these variables, if we want to move Open Science forward. I’ve become interested in strategies for promoting open science for two reasons. First is quite obvious – I’ve already written one the other blog that together with friends we’re trying to find funding for campaign for open science and open education. We weren’t successful yet, but we don’t give up. But if we get the funding, it’s going to be very important to make little or no mistakes, because I don’t think the next chance would happen again soon. The second reasons is that I’d like to see an experiment with doing science in the open on some really large scale, let’s say couple of universities, small country, etc. Large experiments tend to expose all kinds of issues we didn’t expect and at the same time they allow new opportunities to emerge, because they change dynamics in the environment. Academic environment isn’t going to be the same anymore if for example the half of UK or all Max-Planck Institutes would open the research process. In the comments on recent post on rankings, I’ve mentioned that I would consider (among other things) using or rather abusing ranking systems available on the net in executing campaign promoting Open Science. Maybe it’s a wrong idea – Bjorn, Bill and William have pointed out a number of its flaws. Maybe it’s a bit unethical. However when I look how “Open Access” is marketed (it’s useful to know that Harvard or NIH went OA, but it’s not a meritorious argument, even in the US; also people still use “increased citation ratio” as an argument in favor of OA, slipping over the fact that the effect will basically disappear when majority of papers are OA), I’m not that sure abusing ranking system is much worse than that. As Bill suggested, we might to the thing openly, so everybody interested know how and why we’re doing that. 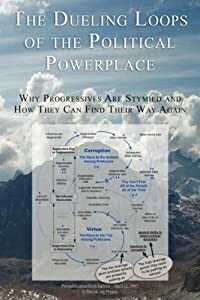 Things became even more interesting in the light of the paper entitled The Dueling Loops of the Political Powerplace, published on the well known portal promoting analytical activism and systems thinking, thwink.org. The paper and the whole site has strong political bias, however it contains very good point concerning pushing sustainability agenda. The main point is that environmental activists are focusing on low leverage actions, such as spreading “true memes”, while actions with much higher leverage are spreading “repulsion memes” and ability to detect “false memes”. As I understood that, for open science activists it would mean writing more about why closed science is bad (wasting money, stiffling innovation etc.) and how scientists, agencies, institutions are closing down research, instead of writing about good sides of opening up the research. I have written on Freelancing Science blog that Open Science needs better targeting and simple message. What if we add selecting topics of posts and publications, and creating artificial hype around the idea? Are you ready to try something like that? Openly?